Hypnagogia defines the state between sleeping and waking: the state in which our dreams can seem more real to us than the waking world, and which, depending upon the nature of our dreams, our limbo-selves seek to flee, or to sustain. My primarily mission in attending Hypnagogia at the Climate Theater was to see the performance of The Flip Quartet by Polly Moller, as I will be part of upcoming performance of the piece in July. The performance featured Karl Evangelista, Jason Hoopes, Thomas Scandura and Bill Wolter. The Flip Quartet is a composition for four improvisers who move between four stations representing the cardinal directions (north, east, south, west) and the four medieval elements: earth, air, fire, water. 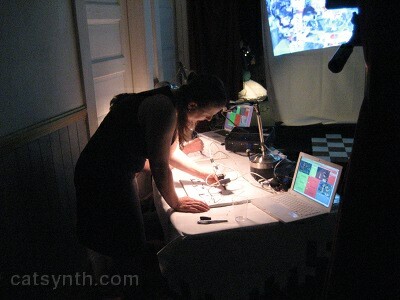 Each station had a variety of instruments and sound-making objects to represent elements. 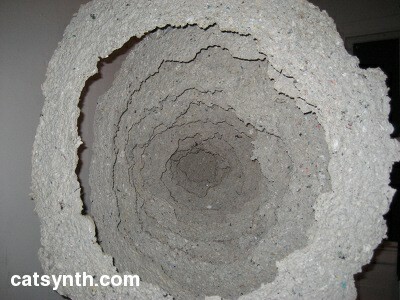 “Earth” had drums, stones, and blocks. “Air” included various wind instruments and shakers. “Fire” featured metal instruments and electric instruments (keyboard, electric guitar, etc.). And “Water” included water-filled containers, but also acoustic string instruments – this was the only association I had a difficult time figuring out, with my own interpretation being “standing waves.” Each section of the piece starts with the performers “flipping” a timer. When the time runs out, they stop and move on to the next station. The audience sat in the middle of the theatre, with half the seats facing one pair of elements and half facing the others. Since there were two performances, I got a chance to see and hear the piece from “both sides.” Musically, the piece unfolded as ever changing harmonies of the different objects, often very discrete and percussive, along with many theatrical moments such as attempting to balance on the “earth” elements on the head of a drum. My favorite moment musically was the combination of the Asian pipe (shown one of the photos above), lute, shakers and thunder tube. 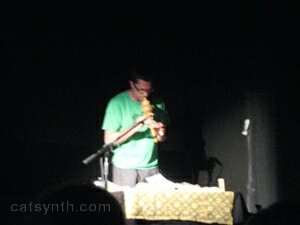 The other musical performance was Philip Greenlief performing a solo work The Fourth World. The piece is based on Hopi conception of time and the Fourth World from Hopi mythology, and is a solo performance featuring Greenlief’s expressive and virtuosic saxophone playing. I am always impressed with his multiphonics, which he manages to make seem as easy to play as standard tones. Spatially, this performance was the opposite of The Flip Quartet, with the audience seated in a circle facing inward and creating a more intimate space. In addition to the featured live musical performances, there were visual art pieces, installations, and media and performance art. Sean Clute, Jessica Gomula and Gina Clark presented a “video action painting and performance” entitled Slippery Dreams 2009. Live video of the drawings being created were projected onto the screens, and I believe also used to control the sound that was generated. Louis Rawlins presented the installation Sleep Patterns, set up as a bedroom or sitting room where one could relax and touch the ball of yarn on the table. The string (which included conductive thread) was used to generate sounds in response to the viewers interactions. 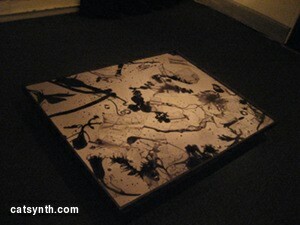 Presumably, one could interact with this piece while asleep. Finally, as it was quite stuffy inside the theatre and gallery on this rather warm night, there was the welcome retreat to the rooftop, where VoxMaids performed rhythmic and traditional-sounding music for drums, accordion and voices against projections of astronomical objects. 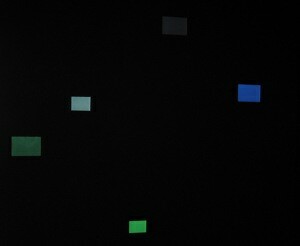 Alternatively, one could look at a real astronomical object, the moon, on this rather clear night. It occurred to me that his etchings had an extraordinary correspondence to the methods he utilized in composing his music – and that they were visual counterparts of sorts, related in a manner that one might not have expected…But the connection between Cage’s use of “chance” methodology in his various kinds of work (composing, writing, installation & performance art, & now printmaking) made sense in a way that awakened me to the great scope of his work. I don’t think this was a special exhibition per se, as Cage had a longstanding relationship with Crown Point Press and they have displayed his work on several occasions. 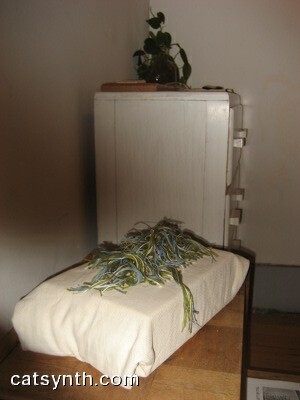 The main exhibition was a series of works by Tom Marioni. Both Marioni and Cage were featured in The Art of Participation at the San Francisco Museum of Modern Art (SFMOMA). Among the works in the exhibition were Marioni’s Free Beer (sadly, no free beer was being dispensed at the time, even though it was “Superbowl Sunday”), and John Cage’s most famous piece 4′ 33″. The full score was posted on a wall, and it was also displayed on a grand piano in its original form. I can’t say this was presented as a “participatory work”, however. Simply looking at the piano and listening to the museum commotion for the alloted time does not constitute a proper performance of the piece. Christopher Fleeger opened the evening with lively performance featuring a touch screen, percussion controller and laptop. The music mixed synthesized and other familiar electronic sounds with some odd and amusing recordings, such as a rap extolling the virtues of Tallahassee, Florida as a center for faiths of all kinds, and a very memorable piece of “stand-up tragedy” about one man’s experience with “the store” – in the poem, every line ended with “the store” and often included other references. 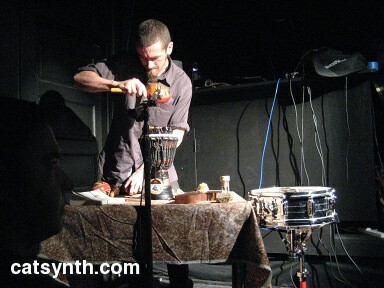 The second performance was by James Goode and featured a mixture of acoustic sources (percussion, toys, etc.) with sampling and looping, and reminded me a bit of my own performances at the Santa Cruz Looping Festival and other venues (it reminds me that I haven’t written about that). It can sometimes be a challenge to sustain full energy for an entire solo set of this nature, but Goode made this seem easy. Goode and Fleeger closed with an extended duet improvisation. At least one balloon went flying into the audience. 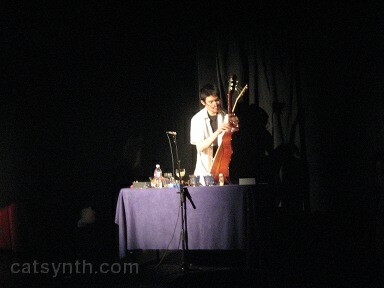 I also attended the Saturday performance of the 2009 San Francisco Tape Music Festival, which I will discuss in a separate article.